Front Centre Section created in preparation for the wing/ Fender modelling. This is quite a good surface set, but I ‘ve had no time to light it better. At the moment my lighting is making a good surface set look like really poor! I’m going to have to find some time to properly light the scene. First Look At Surface of the hood top. Oh my God! 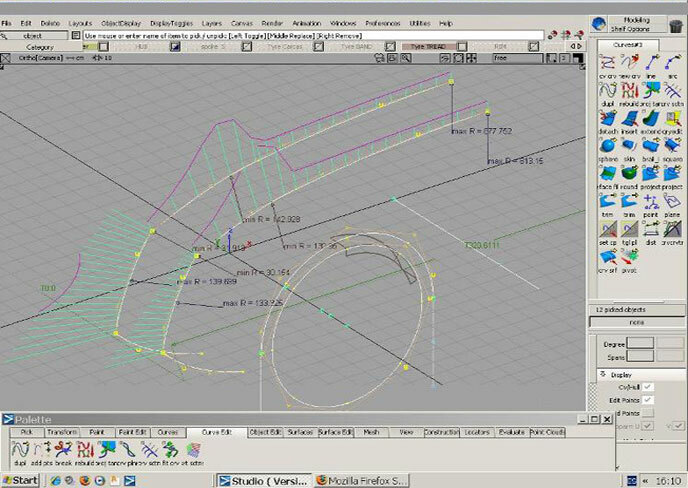 I have been trying to build this in between several other jobs and as you can see, I have a lot of problems here and the only thing to do is to delete the surfaces, improve the curves to obtain surface continuity where required and then build the surfaces again taking more care to match meeting surfaces. They should have the same construction at adjacent boundaries i.e. the same surface degree ( degree: 3 – 1, deg.5 – 1, .) and they should have matching surface isoparms, if I am forced to make the surface more pliable by adding 1 or 2 extra spans. 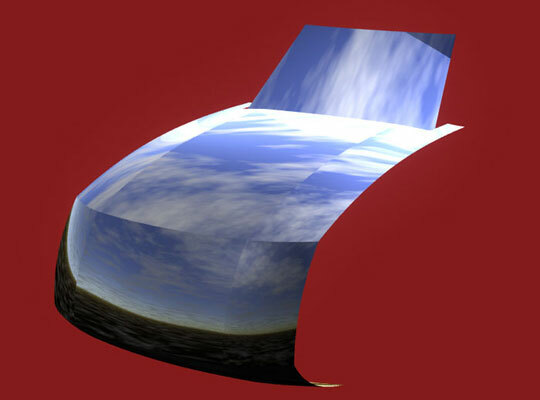 Surface Quality with Diagnostic Shading Turned On. Here I went back and broke the hood down into 3 more manageable surfaces. After I built them I re-invoked the Square surf. tool and going into Advanced setting, I used Explicit control to alter the degree of each square in both the U and V direction with the horizontal edges set to Curvature, until I reached an acceptable result. 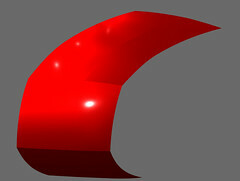 This is a simplified explanation of how to resolve the hood top surface construction geo. 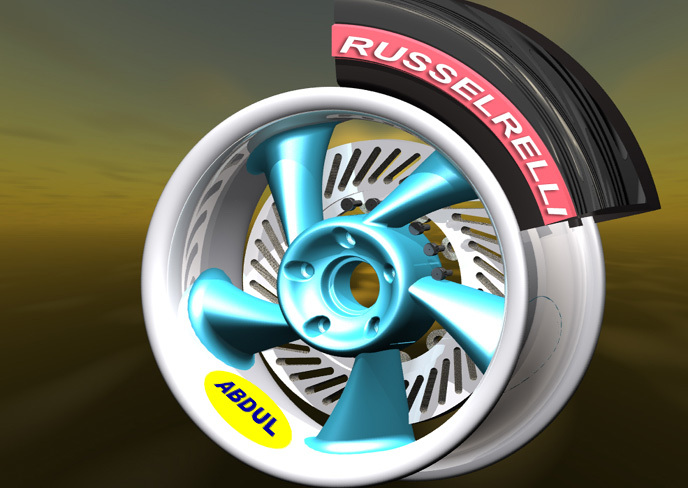 Here’s a nice wheel customized by one of my students, Russell. 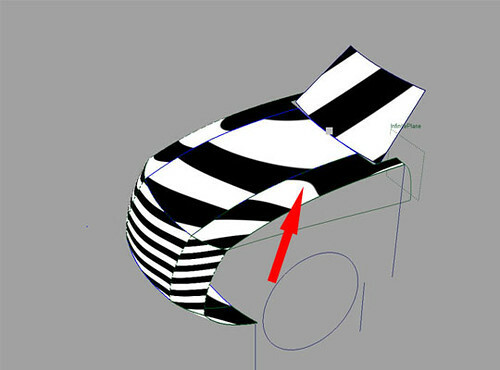 My student’s latest model is growing after making major changes to arrive at special body kit design. 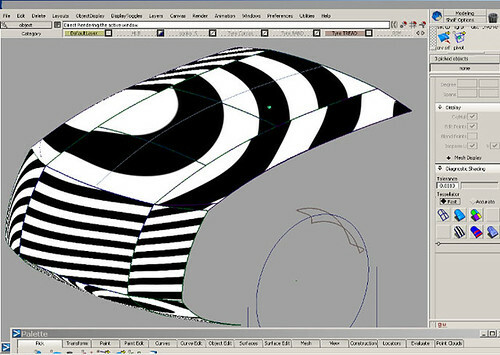 These are just the basic surfaces, which I will cut into to create all the tasty front end detail. Taking the dogs out now. Its very sunny with a wonderful blue sky.Once I’ve done that I’ll email my wire to my student who can then bring his model up to my level, emailing me for help as and when he needs it.Most of the surfaces on this model are Beginner’s Level, but at least now I know where I have to improve. 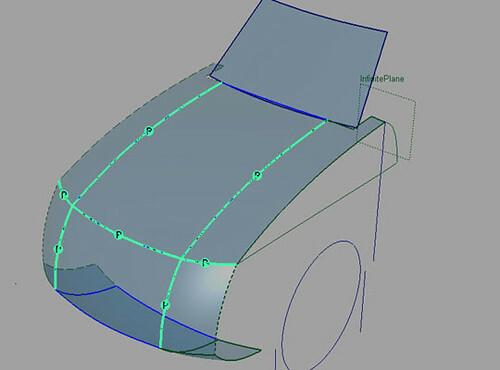 There aren’t any tutorials available for Automotive Design,I teach Alias Surfacing Techniques by stting work in all areas of product design . 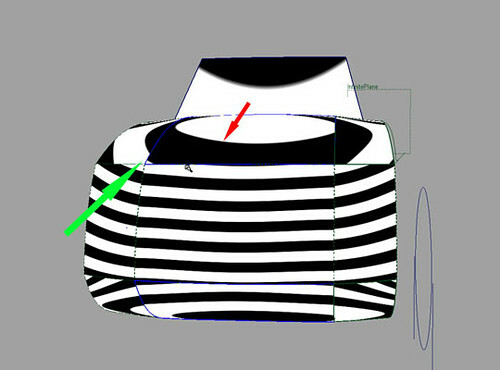 I am now working on a Nike style sports watch, which involves Natural Surfacing I use this tutorial a lot. It’s a really tough one, but once done you learn so much from it. 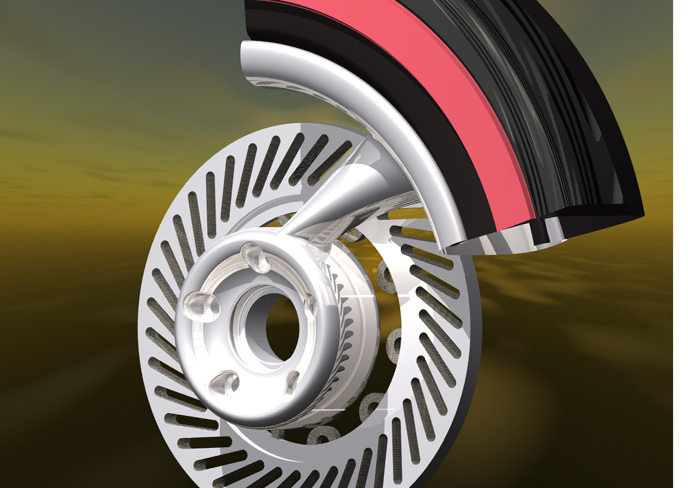 So my heart felt thanks go out to Joshua Maruska for writing “Natural Surfacing” on Aoutdesk Alias Designhttp://aliasdesign.autodesk.com/learning/tutorials/? I teach a lot about how to build more accurate surfaces and how to get better flow across surface boundaries where needed. It’s not going to come to students over night. 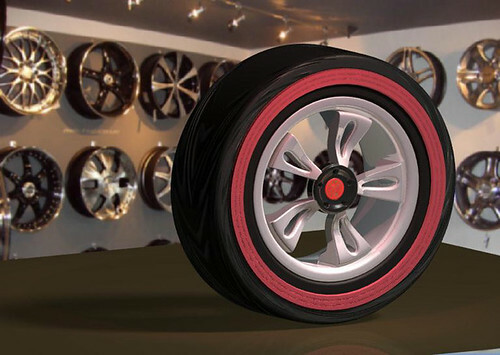 They will only improve by following lots of tutorials and practicing with the Alias surfacing tools. 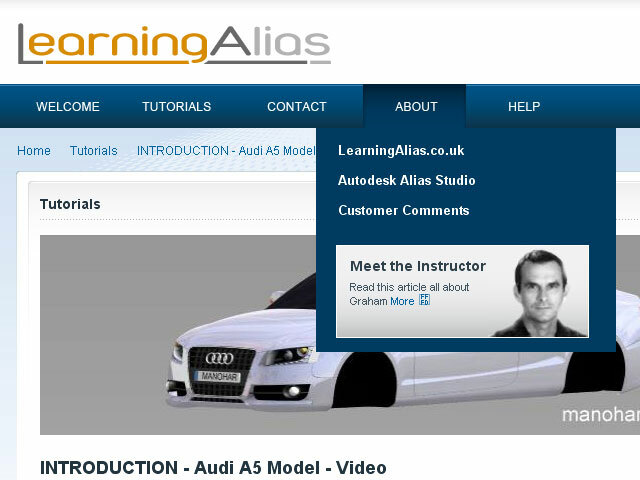 You need to register on the Autodesk Alias Design website, where you’ll be able to dowload tutorials and shaders etc.This website has a high standard forum and when you reach a good intermediate level, you will be able to ask serious queastions about Alias and get answers from the top experts. and you must progress from one model to the next sensibly and not set yourself up for failure by leaping onto projects that are just too difficult for your level. Last week one of my private students bit off more than she could chew trying to make a wing mirror. Her comment to me was. ” I was unable to finish it to a professional standard as I had no help and didn’t even know if it had been direct modelled in the first place”.She had no Internet that week and was unable to get support from me. and then Lazar scanned into Alias as cloud data for enhancement (Class A surfacing with G3 curvature cont.). It is really hard working in isolation). Here’s another very common comment from students.